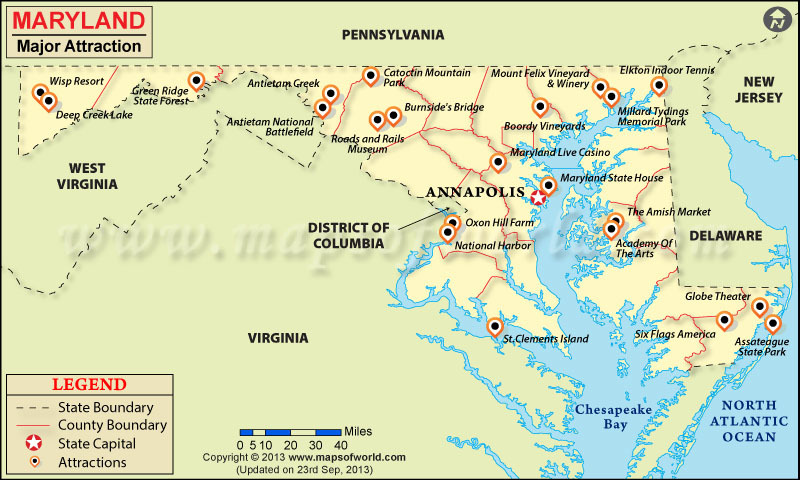 Maryland is home to seventy-one National Historic Landmarks. This state gave birth to the America's national anthem. Historical Places The Maryland Historical Society, Harpers Ferry National Historical Park, Fort McHenry, South Mountain. Other Places Chesapeake Beach Railway Station, Concord Point Lighthouse, Salisbury Zoo, Robert Long House. Located in Washington County, the Washington Monument State park honors George Washington, the Father of the Nation. The monument is located within the state park. The state park is located four miles east of the town of Boonsboro, and has an area of 104 acres. The monument was completed on July 4, 1827 and was added to NRHP on November 3, 1972. The Patapsco Valley State Park has an area of 16,043 acres and has five developed recreational area. It offers hiking, fishing, camping, canoeing, horseback riding and mountain bike trails, and picnic spots for visitors. The park is operated and Maintained by Maryland Park Service under the authority of Maryland Department of Natural Resources. It is home to the Thomas Viaduct bridge. The bridge is the first multi-span masonry railroad bridge in the country to be built on a curve. It was completed on July 4, 1835. Other notable sightseeing places in the park are Swinging Bridges and Cascade Falls. The Chesapeake Beach Railway Station is located at Chesapeake Beach, Calvert County. It is a historic railway station and is composed of two one-story, hip-roofed sections. It was built in 1898 and is now operated as a railway museum. It was listed on the National Register of Historic Places in 1980. Fort McHenry is located in Baltimore, Maryland. It is a star-shaped fort and is famous for its role in the War of 1812. It was here that the American national anthem was written by Francis Scott Key. The fort was designed by Jean Foncin and was built after America won its independence. It was built to defend Port of Baltimore and was positioned on the Locust Point peninsula. It covers an area of 43 acres and was established on March 3, 1925.